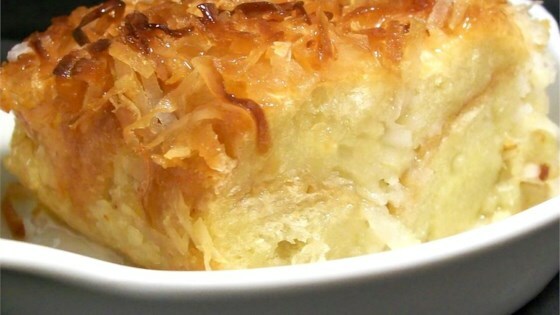 "The classic bread pudding is enhanced with coconut flakes and coconut milk." Preheat oven to 325 degrees F (165 degrees C). Grease a 9x13 inch baking dish with butter, and dust with confectioners' sugar. In a large bowl, combine sugar, eggs, egg yolk, coconut milk, cinnamon, nutmeg, salt and coconut extract. Mix until smooth. Stir in 1 cup of flaked coconut, and 1/2 cup fresh coconut. Fold in bread cubes until evenly coated. Pour into prepared baking dish. Set aside for 30 minutes. Bake on a cookie sheet in preheated oven for 25 minutes. Sprinkle top with remaining 1/2 cup flaked coconut. Continue baking for 25 to 30 minutes, or until center springs back when lightly tapped. Sweet French bread soaked in coconut cream, nutmeg, and cinnamon. I used this on leftover hotdog buns after a picnic and created quite a stir! Yummy!